So far in this series, I have proposed and detailed a method for estimating the capacity of watercolour brushes to deliver paint to the paper, and presented results on 18 brushes tested. Those results confirmed the generally accepted view that sable brushes deliver more paint to the paper than those with synthetic fibres, but added that the brushes with the greatest capacity were disproportionately costly for their improved performance. Careful choice can therefore provide brushes with the best capacity relative to their cost. In my last article, I noted that test results on some brushes, particularly certain sables, appeared to vary more greatly than others, notably synthetics. So I will start this article by looking in more detail at error and consistency of results. To do this, I took three of the size 12 round brushes tested last time, and repeated measurements on them for 12 consecutive tests (fully charge, weigh, discharge, re-weigh). Those enable proper statistical analysis on the measurements, and comparison with my original results. The three round size 12 brushes used for intensive testing. From the top: W&N AWC Sable, Jackson’s Tajmir-Kolinsky Sable 1205, W&N Cotman 111 synthetic. Looking first at the raw weight measurements, averages and confidence intervals appear generally very good, with only low variation apparent, except for the Jackson’s sable, which had significantly greater variation in mass when both fully charged, and when discharged. This was mainly because the weights for its first test were low, and it was not until its fourth test that they reached maxima. This was similar to the pattern in its original testing: on the first test it would have painted an area of around 231 cm², on its second increasing to 271 cm², and on the third to 287 cm². The other two brushes tested in this series did not show any similar effect, so their weights and derived results were less widely spread. Several other brushes tested previously showed similarly low weights and results on the first test alone; these included both sables and synthetics. Other brushes returned their highest results from the first tests. 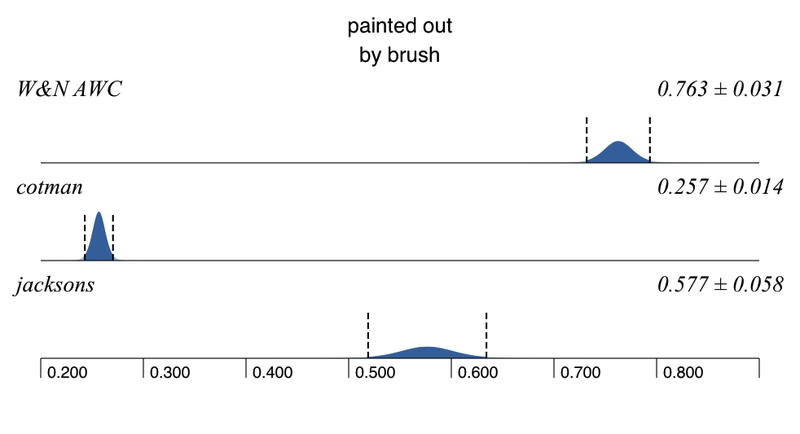 There is no obvious pattern of manufacturer, fibre type, or brush size which appears to relate to these order effects, although in some brushes they are so marked that the first result is less than 70% of subsequent values. Otherwise the results shown in the table below, given as averages with 95% confidence intervals, appear very acceptable. The W&N Cotman 111 synthetic delivers the least paint, sufficient to cover 121 cm², 95% confidence range 114-128 cm²; previous test results gave a median coverage of 122 cm² from a range 119-124 cm². Mass of water (paint, in grams) delivered to the paper by the three brushes tested, with 95% confidence intervals. Formal statistical analysis on these repeated tests shows that the results are statistically significant, in that the average mass of paint delivered to the paper varies with brush (ANOVA F(2, 33) = 213.536, significant at p < 0.001). I conclude that my previous test results appear to be sound and acceptably accurate, at least over these three brushes. Because these new results imply rather better performance on the part of the most expensive of the three brushes, the ‘value for money’ figure for the W&N AWC Sable round size 12 could be increased from 5.11 to 5.6 cm² per £ cost. However this remains in marked contrast to those for the better value Jackson’s sable (9.7 cm² per £) and the Cotman synthetic (11.2 cm² per £). Furthermore each of these differences is statistically significant, according to these additional tests. The flat or ‘One Touch’ brushes in 13 mm or half inch sizes. Last time I included a single (synthetic) oval wash brush, and a couple of large squirrel mops, which delivered the largest amounts of paint according to those tests. I therefore thought that it would be worthwhile to compare some smaller flat brushes of different composition, mainly with respect to the type of hair or fibre. Although Winsor & Newton no longer offers the Cirrus range, I suspect that results for their Artists’ Water Colour equivalent would be similar. The Da Vinci squirrel brush is slightly smaller than the others (as seen in the photo), but this appears the closest comparison. The results above imply that, once again, pure sable brushes deliver most. However one of the mixed sable and synthetic brushes, the ProArte Connoisseur, also did very well, and achieved a very high cover/cost result. I was surprised that the squirrel brush was in third place, suggesting that squirrel hair is good for larger mops, but does not perform so well in smaller, flat format. Should you opt for a One Touch or other flat brush rather than a round? In terms of delivery capacity, it is probably fairest to compare these 13 mm or half inch flats with size 10 rounds, which are of similar performance and cost. So it comes down to personal preference over the shape and its utility. But sable-synthetic mixes are definitely a good choice for value. The test method that I proposed appears to deliver acceptably accurate results, although it may merit refinement to allow better for brushes whose first test result is likely to be exceptionally low. Using the median of the three test results does work around this to some degree, although it may still put some brushes at a slight disadvantage. Three excellent round size 12 brushes, with significantly different paint delivery and value for money. The difference in behaviour between brushes described as “Sable”, “Tajmir-Kolinsky Sable”, and the like, suggests that not all are equal. Brush manufacturers might like to look more closely at what is going on with these ‘slow starter’ sables; this might, for instance, be a result of certain types or batches of hair requiring hydration before they attain optimum performance. One practical recommendation for watercolour artists is to ensure that sable brushes, in particular, are wetted thoroughly before charging them with paint. I have not seen this suggestion anywhere before, but a previously wetted sable may well take up more paint than one which is completely dry to start with. This is counter-intuitive, and will of course require you to make your wash stronger to allow for water which is already in the brush. The bottom line, though, remains that you get what you pay for, but higher prices bring diminishing returns. One type of brush which I need to test more extensively is that with a mixture of sable and synthetic hair/fibres. Some of these mixtures are clearly delivering performance almost as good as that of pure sable, and I need to identify which are the best on test. I have just obtained more round size 12 brushes for test, and will be extending the range of other brushes. If you have been carrying out your own tests and have results which you can share, I will be delighted to welcome guest contributions here. Improving our knowledge and understanding can only be for the better. Copyright: © 2015 EHN & DIJ Oakley. Please respect our intellectual property rights: you are most welcome to fair use of the material in these articles. However if you want to reproduce more, most, or all of any of these results, please contact me to agree this. In most cases I would prefer that you linked to this article, and gave me due credit. Declaration of interest: I have no commercial or other connection with, other than being a customer of, Jackson’s or Forget-me-not (my local retailer, in Newport, Isle of Wight). With the exception of a single brush (value less than £10), all the brushes tested were purchased by me from Jackson’s or Forget-me-not. These tests were carried out independently of all manufacturers and retailers. W&N = Winsor & Newton. Posted in Painting, Technology and tagged brush, cost-benefit, error, method, painting, procedure, sable, statistics, synthetic, testing, watercolour. Bookmark the permalink.